Labor Groups Blast Working Conditions In Qatar Ahead Of World Cup : The Two-Way Their call comes on the same day the BBC said a reporting crew spent two nights in a Qatari jail for trying to film migrant workers who are building the infrastructure for the sporting event. 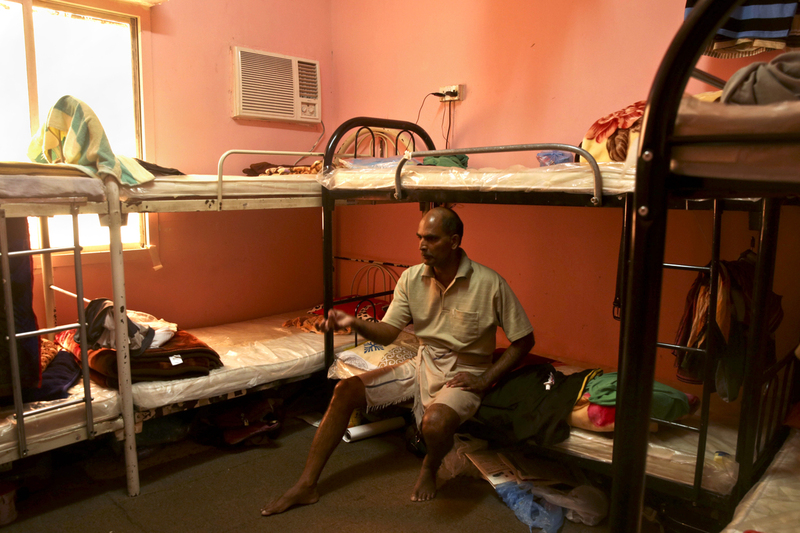 In this photo taken May 3 during a government-organized media tour, Kuttamon Chembadnan Velayi from Kerala, India, speaks to journalists while sitting on his bed in a room he shares with seven other Indian laborers in Doha, Qatar. The housing facility has been cited by Qatari labor officials for substandard conditions. Worker-rights groups are calling labor conditions in Qatar "horrific" and urging FIFA sponsors to take responsibility ahead of the 2022 soccer World Cup. Their call comes on the same day the BBC said a reporting crew spent two nights in a Qatari jail for trying to film migrant workers who are building the infrastructure for the sporting event. "Sponsors know that Qatar is a slave state," Sharan Burrow, general secretary of the International Trade Union Confederation, said at a news conference. "This is the richest country in the world and they don't have to work this way. ... Fans don't want the game to be shamed this way." ITUC singled out Adidas, Budweiser, Coca-Cola, Gazprom, Kia, Hyundai, McDonald's and Visa, saying the companies had the power to make Qatar improve labor conditions for its approximately 1.2 million migrant workers. The issue of working conditions in Qatar has been a focus of much scrutiny ever since the Arab country was awarded the 2022 World Cup. Several news organizations and human rights groups have chronicled its often dismal working conditions. The BBC reported Monday that a reporting crew spent two nights in jail for trying to report on the conditions under which the laborers, mostly migrants from South Asia, live and work. The crew was later released. Qatari officials said the BBC's Mark Lobel and his crew were trespassing. FIFA, in a statement, said it was seeking "clarity from the Qatari authorities" about the situation. Earlier this month, Qatar officials detained German reporters who were working on a story about the controversial process under which Qatar was awarded the World Cup. The material they compiled during their trip was erased.